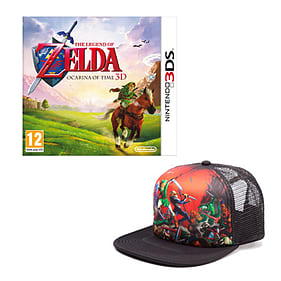 The Legend of Zelda: Ocarina of Time 3D takes the Nintendo 64 classic - one of the most critically acclaimed games ever made - and returns it to the Nintendo 3DS system with the added depth and realism of stunning glasses-free 3D visuals. The Legend of Zelda: Ocarina of Time 3D takes the Nintendo 64 classic - one of the most critically acclaimed games ever made - and returns it to the Nintendo 3DS system with the added depth and realism of stunning, glasses-free 3D visuals. Link sets off on a legendary journey through time to stop Ganondorf, the Gerudo King of Thieves who is seeking the Triforce: a holy relic that gives its holder ultimate power. The graphical upgrades and three-dimensional depth breathe new life into the expansive world of Hyrule. Amazing 3D visuals and a complete graphical overhaul bring one of gaming's most beloved and celebrated franchises to life, putting the awe-inspiring world in the palm of your hand for you to explore whenever you like. The Legend of Zelda: Ocarina of Time 3D retains the analogue control of the original, using the Circle Pad on Nintendo 3DS, but greatly improves ease of use with a touch-based inventory system. Switching items has never been simpler or quicker. a bush monster firing balls out of its mouthAn improved and intuitive interface, coupled with the easier navigation offered by playing in a world with 3D visuals, give players better control as they solve puzzles, travel through time and explore this immersive world. Whether you're a first-time player or a regular visitor to Hyrule, The Legend of Zelda: Ocarina of Time 3D is a new adventure for everyone.